Efficient and stable management of real estate assets helps ensure macroeconomic stability, economic growth, and job creation. Photo credit: ADB. The Republic of Korea's indirect investment vehicles in real estate―notably, Real Estate Funds (REFs) and Real Estate Investment Trusts (REITs)―are lagging far behind their global peers. This is mainly because most of them have been established as small, temporary, privately traded companies, the "one-real estate-for-one-company" regulation has stifled economies of scale, and the market has been subject to more rigorous restrictions and regulations compared to other countries. To turn this around and develop the scheme as a sound investment option for individual investors, several tasks lie ahead. First, relevant ministries and authorities need to share a vision on the role of indirect investment in real estate in the national economy, and strengthen policy coordination accordingly. Particularly, REFs and REITs are governed by two different laws that it is essential to make a clear distinction between their roles to improve market efficiency. 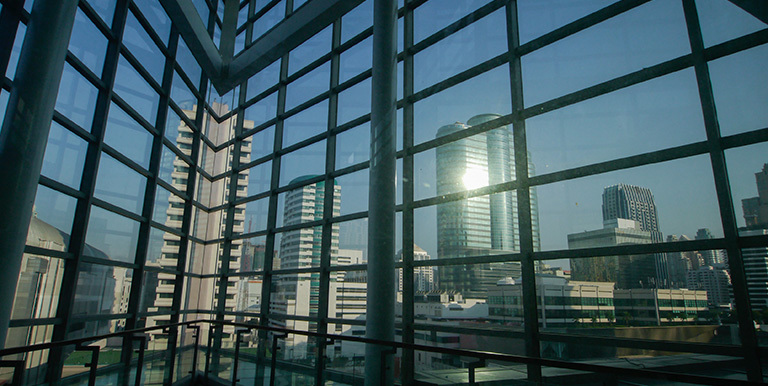 Second, greater efforts are needed to establish publicly traded REITs and seek a new business model such as sponsored REITs whereby asset management subsidiaries of leading financial groups, real estate-related public institutions or large construction companies participate as a large shareholder. Third, each REFs and REITs needs to grow larger in volume, possibly through M&A deals, and build more diversified investment portfolio, to attain economies of scale and earn investors' trust. The current heavy bias toward office and logistics needs to be expanded to rental housing, hotels, SOC, medical facilities, aircrafts, and offshore real estate, both for the purpose of broadening investors' choices and allocating risks. The fourth task is a regulatory overhaul. Specifically, investment restrictions and listing requirements need to be eased for REITs, the criteria for a qualitative review of REITs need to be clarified, and the idea of allowing listing on KOSDAQ needs to be positively considered. Also, self-managed REITs may be allowed to write off dividends as loss, or receive deduction for corporate tax to mitigate the current problem of double taxation. In countries with advanced real estate industry like the US, the UK and Australia, real estates are often grouped together with finance and insurance and termed as FIRE (Finance, Insurance & Real Estate). This reflects a wide recognition that real estate is a part of finance or at least closely tied to it, and it naturally stems from this perception that development of real estate-related financial products is quite important for macroeconomic stability and market risk management. In the Republic of Korea, as real estate-related businesses grow, it is expected that the scope of related research and policy discussions would expand from the current focus on home ownership and mortgage loans to include commercial real estates, housing rental, SOC, and urban revitalization. Also, more discussions would follow on developing financial products and managing risks regarding acquisition, development, management of real estate. Currently, land and buildings represent about 86.4% of the national wealth of the Republic of Korea, which is estimated to be about 1.3 quadrillion won, and the share is significantly higher compared to other countries (e.g. 35% in the US). Similarly, real estate represents nearly 70% of household assets. Given this, efficient and stable management of real estate assets are crucial for ensuring macroeconomic stability, strengthening growth engine of the economy, and creating more jobs. In the past three decades, one of the notable trends in real estate-related finance is a sharp growth of public sphere through securitization and indirect investment vehicles. This trend gained traction as the integration of capital markets and real estate markets accelerated around the world since 2000. RMBS and CMBS―securities issued against residential or commercial mortgage loans as underlying assets―are a typical bond-type investment product, which have grown substantially in the US and Europe. REFs (Real Estate Funds) and REITs (Real Estate Investment Trusts) that are growing briskly in the US, Japan, Singapore, Australia and Canada are a leading example of publicly traded equity-type investment products. In the Republic of Korea, policy-backed mortgages (e.g. Nest Loan, Stepping Stone Loan, Conversion Loan) have steadily grown to represent 24% (or 135.7 trillion won) of entire mortgage loans (563.4 trillion won) as of end-July 2017. A majority of them have been securitized through Korea Housing Finance Corporation―about 115 trillion won as of end-September―indicating a significant growth of the market for bond-type investment in real estates. In comparison, indirect investment in real estates through REFs or REITs remain weak, considering the volume of economy and the development of overall financial markets in the Republic of Korea. In the US and Australia―countries that introduced REITs first―market capitalization of publicly traded REITs each represent 5.75% (227 REITs worth 1,259.9 trillion won) and 7.83% (56 REITs worth 120.1 trillion won) of nominal GDP as of end-June 2017. The same share in Japan and Singapore, which introduced REITs around the same time as the Republic of Korea, each stands at 2.14% (58 REITs worth 116.7 trillion won) and 17.86% (36 REITs worth 58.8 trillion won), compared to the Republic of Korea's 0.02% (4 REITs worth 0.3 trillion won). Despite that real estate comprises a significant share of national wealth in the Republic of Korea, indirect investment market remains very small. In this article, we examine the causes and related issues of such stagnant growth, and discuss how to stimulate the market and how to improve market access for individual investors from a standpoint of financial inclusion. In the Republic of Korea, indirect investment in real estate is mainly divided into REITs and REFs. Both receive funds through indirect investment vehicles, invest them in real estate, related loans or securities, and generate profits to return to investors. Still these two schemes are governed by different government ministries and laws, subjecting them to markedly different regulations in terms of legal nature and asset management. The establishment and management of REITs is based on the 2001 Real Estate Investment Corporation Act, governed by the Ministry of Land, Infrastructure and Transport. The act states that the purpose of introducing REITs is to "expand opportunities for individual investors to indirectly invest in real estate and promote sound investment in real estate to contribute to development of the national economy", and to this end, allows relatively easier access of small investors, with publicly raised funds, listing on the exchange and broad circulation in the market. In pursuant to the Commercial Act, REITs should take a form of a corporation with asset management capability, and as such, should have governance structure that includes shareholders' meeting, board of directors, and auditors. Investors are allowed to directly engage in asset management. In comparison, the establishment and management of REFs is based on the 2007 Capital Markets Act, governed by the Financial Services Commission. While REITs should be in a legal form of incorporated company, REFs have a broader option as they can be corporations, business trusts, investment corporations, or investment products. Thus, in a broader sense, REITs can be seen as a type of REFs, but the latter mostly manages assets in a closed manner through collective investment vehicles, excluding participation of individual investors. For this reason, REITs have been at the center of fostering indirect investment in real estate in many countries, with their opportunities for public offering and easy circulation, and we also focus on REITs in this article. In the Republic of Korea, indirect investment in real estate has been growing briskly against the background of declining returns on traditional investment and ample liquidity in the market. REITs had grown slowly since its inception in 2002, but the pace has picked up since 2008. Between end-2011 and end-August 2017, the number of REITs increased from 69 to 186, and their total assets increased by 3.6 times from 8.2 trillion won to 29.2 trillion won. The investment is concentrated on office (40.3%), residential housing (35.6%), and logistics (15.7%). Despite steady growth, domestic REITs market remains very small―both the whole market and individual REITs―compared to advanced countries. The amount of asset per REIT is a meager 1/30 of the US, 1/15 of Japan, and 1/18 of Australia. As the market growth has been led by private REITs, publicly traded REITs are even smaller. As of end-September this year, only four REITs were listed on the stock exchange with a total market capitalization of 0.3 trillion won. This stunted growth is partly attributable to a regulation that restricts each REIT to invest in only one real estate. Meanwhile, REFs began to grow sharply in 2010; between end 2011 and end-September 2017, the number of funds grew from 342 to 1,074, and their assets from 16.4 trillion won to 56.6 trillion won, or about 3.5 times. However, they remain not very accessible to individual investors as it is customary that asset management companies and securities firms jointly collect investment funds in private bids (97% of all funds), take over real estates, increase their values, and sell them to institutional buyers at a profit. Another problem is that associated risks escalate along the stages of transactions. The market for publicly traded REFs is receiving growing attention lately, but has yet to grow in earnest. Clearly there is a growing interest in public offering of indirect investment in real estate, backed by the brisk growth of the market and the government's supporting measures. Nonetheless, most of REFs and REITs remain as privately traded, temporary investment vehicles (98%). During the last decade, broad research has been conducted on REITs in countries like the US, Australia and Singapore, and they have suggested a number of overlapping prerequisites for successful REITs. First, they should be publicly traded companies with an easy access to individual investors to ensure economies of scale and governance structure for transparent business management. Second, they should build a solid, competitive portfolio that can generate profits. And third, a regulatory environment should support REITs to ensure stable business management and maximum investor benefits. Currently, the Republic of Korea's REITs are a long way from this ideal picture. As mentioned earlier, most of REITs and REFs are in the form of privately traded, temporary funds, and their sizes remain small. Still, their attractiveness in the global market is rising as the average three-year dividend yield ratio was 7.4% (5.5% for listed REITs) and 6.2% (for office investment), respectively, for REITs and REFs as of end-2016. In terms of investment portfolio, a few asset management companies, awash with liquidity, are expanding the portfolio to include rental housing, SOC (e.g. roads, harbors), aircrafts, cultural contents like stage performances and film production, as well as offshore real estate. However, the volume remains negligible, and their competitiveness, investment returns and risk management are yet to be tested. Meanwhile, the Republic of Korea's regulatory environment is much poorer compared to countries with highly developed REITs. REITs are in form of incorporated companies, but in practice, they are a conduit for investment, or a special purpose vehicle. And yet, self-management REITs and permanent REITs are subject to unfavorable taxation, and should meet qualitative criteria to be eligible for public offering. Further, many regulations obstruct investment in REITs, for instance, limited capital contributions under the Banking Act and the Insurance Act, and restrictions on ownership structure according to the principle of separating finance and industrial capital. Also, despite similar nature of business, REITs and REFs are governed by two different laws. On one hand, this may broaden investors' options, but it may also cause confusion in policy making and regulation. Another block to more active REITs and REFs markets is that they are not allowed to be listed on KOSDAQ. Going forward, to foster indirect investment in real estate and develop it as a sound investment scheme that also promotes financial inclusion, some of the regulatory overhauls would be inevitable. First, policymakers need to share a vision on the role and future direction of indirect investment in real estate, and strengthen policy coordination accordingly. To this end, specific plans and ideas are needed to clearly divide the scope and role between REFs and REITs, enhance financial inclusion, and establish integrated supervision. Second, greater efforts are needed to foster public offering of REITs, so that they can contribute to financial inclusion, and improve efficiency and transparency with better governance. As it is, listed REITs in the Republic of Korea are so small that it is hard to earn individual investors' trust. A good reference in this regard could be sponsored (or anchored) REITs  that have been successful in Japan and Singapore. In this scheme, asset management subsidiaries of leading financial groups, real estate-related public institutions with a strong credential, or large construction companies participate as a major shareholder (or anchor) of listed REITs, and by doing so, their reputation and brand value can help ensure investors' trust and confidence. Third, vehicles for indirect investment in real estate need to grow substantially in volume, and their investment portfolio much more diversified. These would require M&A deals with a parent REIT, and increasing the bulk of REITs to realize the economies of scale. A parent REIT might include REFs, as well as REITs, to diversify investment portfolio to rental housing, hotels, SOC, medical facilities, aircrafts, and even offshore real estate, so that investors could have a wider option and hedge investment risks at the same time. Fourth, cleaning up regulatory environment and tax codes is essential to boosting indirect investment in real estate. Specifically, investment criteria and listing criteria for REITs need to be eased, qualitative review for public offering needs to be scrapped or at least clarified to minimize associated risks, and allowing them on KOSDAQ may be considered as well. As is the case in countries with advanced REITs market, it might be also necessary to allow self-management REITs to write off dividends as loss, or allow tax deductions for corporate tax, to ensure an adequate level of investment returns for REITs investors. According to 2016 data of Statistics Korea, the national wealth of the country amounted to 1.3078 quadrillion won, 86.44% or 1.1305 quadrillion won of which are represented by land (6,981.2 trillion won) and buildings (4,323.8 trillion won). According to a 2016 Household Finance & Welfare Survey by Statistics Korea, domestic households had average 342.46 million won of assets, 68.2% or 233.45 million won of which were held in real estate. Real estate investment is largely divided into direct and indirect investment. The latter can be again divided into bond investment based on mortgages and without equity capital, and equity investment that requires equity capital. Or it may be divided into private investment made between individuals and public investment made on publicly traded markets. Domestic MBS market is mostly a primary market, and stimulating its trading with proper risk management is a key task to developing a secondary market. In many countries, REITs have been a dominant vehicle for indirect investment in real estate. It originated in the US in 1961 as a passive investment vehicle; by the late 1990s, its market has been reshuffled to be led by large listed REITs in the US and Australia, followed by Canada, Belgium, and New Zealand. The scheme was introduced in the Republic of Korea, Japan, Singapore, Taiwan, Thailand, Hong Kong, Malaysia, the UK, Germany, and France in the 2000s. More recently, China, India and the Phillipines adopted the scheme. As of end-September 2017, 36 countries had operating REITs companies. However, the market volume in the Republic of Korea was a meager 27.3 trillion won as of end-June this year. According to Real Estate Investment Corporate Act, REITs are classified into self-managed REITs, entrusted REITs, and corporate restructuring REITs. The latter two are paper companies whereby assets are invested and managed by asset management companies, while self-managed REITs has management and employees that directly invest and manage assets. The initial goal of REITs was to stimulate small investment in real estate. However, in the beginning, a special treatment was given to REITs to avoid listing obligation if 30% or more capital was raised from designated institutions including National Pension Fund. As a result, the market growth has been led by conglomerates and institutional investors. Since 2010, many new asset management companies have established REFs, and particularly, the share of offshore real estates in their net assets jumped from 19.9% (3.3 trillion won) to 46.3% (21.3 trillion won) between 2011 and 2016, raising concerns over market overheating. To be listed, a company should meet criteria for revenues (30 billion won for development/10 billion won for lease), profits (2.5 billion won), and equity capital of 10 billion won; for paper company REITs and self-managed REITs, additional qualitative criteria should be met, including perpetuality of business management, transparent governance, and morality of large shareholders. In 2014, Aventree REITs failed at public offering for not meeting qualitative criteria. A conceivable idea is to manage REFs as private, closed, collective investment vehicles for a limited number of institutional investors to pursue short-term profits, while making public offering obligatory for REITs to improve access for individual investors. Japan and Singapore both adopted sponsored REITs. In Japan, affiliates of companies like Mitsui and Mitsubishi own REITs and REFs as subsidiaries, and in Singapore, CapitalLand does the same to develop and manage real estate. Currently, self-managed REITs are deemed to have a legal nature of both a corporation and investment vehicle, and as such, subject to both corporate tax and dividend income tax. Yong-Sang Shyn. 2017. Overseas Cases of Indirect Investment Vehicles in Real Estates. KIF Financial Brief. 17 (05). 10 March. He has a Ph.D. in Economics from Texas A&M University. His work experience includes serving as economist at Korea Institute for International Economic Policy; research fellow at Hyundai Research Institute and Korea Institute of Industrial Technology Evaluation and Planning; associate editor at the Journal of Korea Economic Analysis; and advisor to the Monetary Policy Advisory Group (KOB) and to the Presidential Transition Committee.